In 1993, responding to a request by Conrail's Vice President of Engineering, Dr. John Samuels, an air conditioning and heating unit, designed to cool, heat, ventilate and pressurize a maintenance machine operator's cab, was concepted by Jeremy Crews, chief engineer and founder of Cardinal Research Corporation, a company with 40 years of specialty air conditioning design experience in the marine industry, based in Richmond, Virginia. 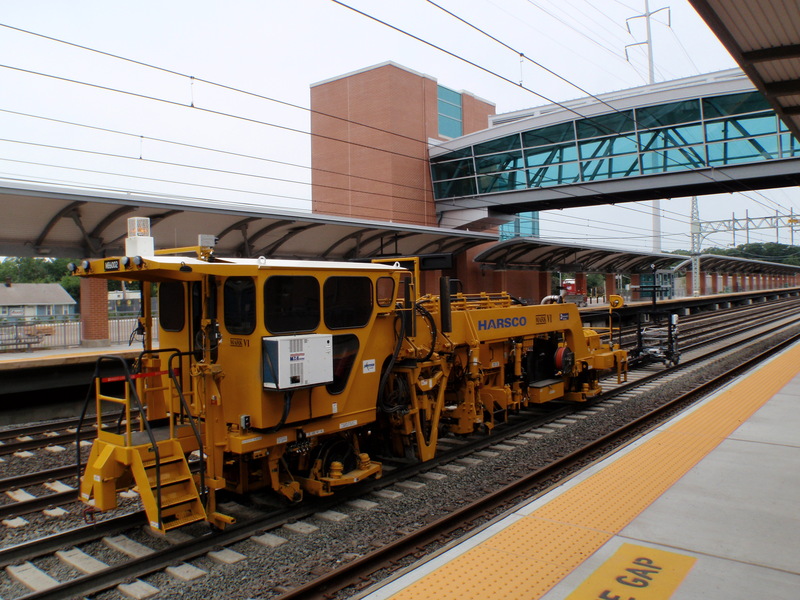 During the summer of 1994, a prototype was tested by Conrail, cooling the operator's cab on a ballast regulator and was found to meet all the performance requirements specified for this new unit by Conrail engineers, operators, installation and service technicians. Based on this success, Mr. Crews founded Macbone Industries Ltd., in Ricmond, Virginia, in 1994, to develop and produce the product. MacBone Industries is now employee owned by President John R. Sniffin and V.P. Ned Sniffin, who took over majority ownership and all company operations frpm Mr. Crews in 2001. Today, MacBone Industries is manufacturing air conditioning products being utilized for heating, cooling, ventilating and pressurizing the operator's cab on railroad maintenance of the way machines, seaport straddle carriers, off road haulers, mining machines, barge tugs and push boats, large farm machinery and fork lift trucks. The MacBone product line includes two air conditioner types, a rooftop model, and a vertical model for installation on a cab sidewall, as well as an auxiliary air filter to prefilter outside air before it is brought into the cab, and a cab pressurizer, which forces filtered air into the cab, maintaining a positive pressure to keep contaminants out. The rooftop and vertical MacBone air conditioning units are identical except for how they are mounted. See rooftop units or vertical units for details. The air filter and filter/pressurizer are accessory products designed to operate in conjunction with any MacBone air conditioner. Although accessory air filters and pressurizers are available as separate accessories for fine filtration and higher pressurization, all MacBone units, operating without these accessories, provide cooling, heating, basic filtered air, cab pressurization, ventilation, and dehumidification through the process of moisture removal with reheat. System capacity is 24,000 BTU's/Hr. cooling and 30,000 BTU's/Hr. heating, under standard rating conditions. The MacBone controls consist of an operator accessible handle which controls the speed of the system, including the cab airflow, which is variable from zero to maximum. A toggle switch and thermostat control the compressor to maintain cooling temperature. A second operator accessible handle controls heat output by varying the heating fluid flow from off to full. The MacBone design also includes air filters, both inside and outside, and a shock and vibration absorption system which is tuned to machine operating frequencies. The fan shaft bearings are sealed and the fan shaft belt drive is automatically tensioned by a spring loaded idler which requires no maintenance. The whole MacBone rooftop package is about 2 feet wide by 3 feet long and 1 foot high and the weight is 165 pounds. The vertical model is slightly larger and weighs 185 pounds. 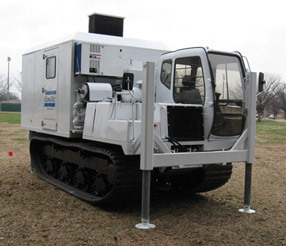 Installation requires a dedicated hydraulic pump driven by the machine's engine at 10 GPM up to 1650 PSI, connected to the MacBone unit by supply, return and motor case drain lines. Supply and return fluid lines are connected if heating is required. The total electrical requirement, which is required only for operating the compressor clutch, is 3 amps at 12 or 24 volts DC. All MacBone units accept DC power from 10 to 28 volts, eliminating the need for different models for each voltage. Note that the MacBone product is a self-contained unit with more of its components outside the unit itself. Attached permanently to the cab roof is a subbase to which the MacBone unit is secured with four bolts. If service is ever needed, in less than one hour, the entire MacBone unit can be removed from the cab and be replaced with a service unit spare. Removal of one wire, three hydraulic lines and four bolts is all that is needed; and a licensed technician is not required. Every MacBone ever built will fit onto all subbases ever delivered. With a spare on hand, A/C downtime is less than an hour. Even without a spare on hand, the unit can be advance replaced, same day as requested, from your service stock which we will store and ship for you. Another option is you can ship the unit to us from the field, on a pallet, motor freight collect and we will repair and return it freight prepaid, on the very next working day after we receive it. If in warranty, which is two full years, there is no charge except for freight (unless it went under a low bridge). If the warranty has expired, we charge time plus materials and we do it fast in our shop. Get on board with the MacBone product and eliminate A/C downtime, reduce overall A/C costs and make everybody smile, from us to you to the crew. It's 888-MACBONE and we'll be listening for you. MacBone - Designed for the application... not borrowed from somewhere else.